I'm in denial. Fall is coming but I feel like spring just ended. The summer was so mild here this year that it feels like we missed out on all the traditional summer activities--going swimming, throwing water balloons, washing the car. I kept waiting for it to get warmer, it never did, and now it's over. So since I'm in denial of the turning leaves and crisp autumn air I'm dedicating the next two weeks to something un-fall like--butterflies. 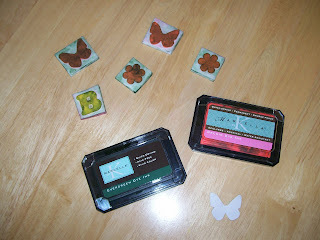 Last week my daughter and I made our own butterfly stamps. 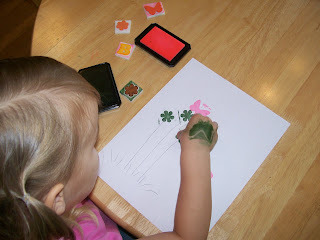 We used foam paper to cut out our shapes (a butterfly, a flower, and the letter B) and then adhered them to a thick piece of foam. 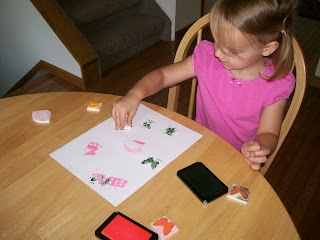 Who knew making your own stamps could be so easy. 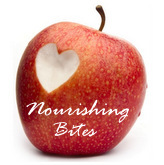 Check back later this week and next week for more butterfly activities. So where di you get the thick foam? I got it from The Scrapbox.